The regular sounds of the Hutt City Musical Theatre will be replaced by those of grunts, groans and bodyslams later tonight. NZWPW Power Play, the promotion’s biggest event of the year, brings six matches to Epuni. Longtime NZWPW Champion Chad Howard defends his title against Over The Top battle royal winner Charlie Roberts in the event’s headliner — a match that has been scheduled since Roberts’ win in July. Since Over the Top, Howard has defended the NZWPW Championship in Wainuiomata and Masterton to assert himself as the man to beat in Greater Wellington. As such, Roberts has upped the ante in this title tilt between former Rodeo Drive partners. Howard and Roberts will meet under Last Man Standing rules to determine who will end 2017 as NZWPW Champion. Roberts took to Twitter to share his thoughts on the bout. The next challenger for the NZWPW Championship (whoever holds it) will be determined when “Rufguts” Roddy Gunn and Shane Sinclair meet under Stirling Rules, named after NZWPW owner/operator Martin Stirling. What Stirling Rules actually are is currently unknown, but both men are expected to turn in a highly-competitive match with a title opportunity in 2018 at stake. 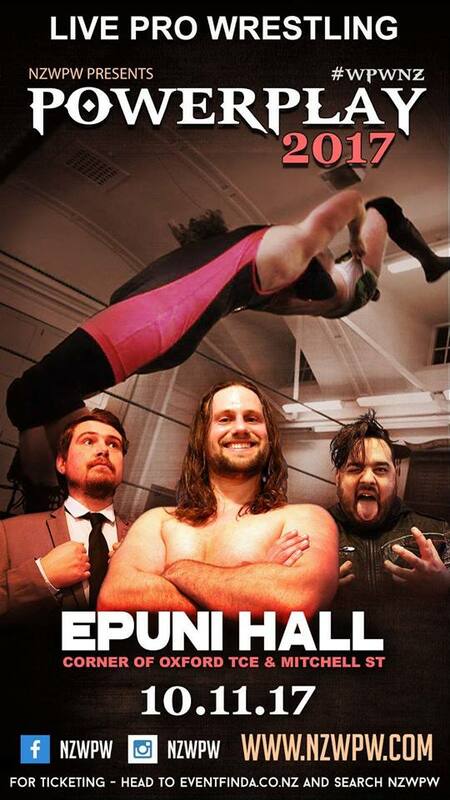 NZWPW Power Play takes place today, November 10, at Epuni Hall in Lower Hutt. Doors open at 7pm with the first match scheduled for 7.30pm. Tickets are available on the door or online via Eventfinda. The card, subject to change, is listed below.